Google has updated the developer dashboard again, and that means new version stats. It wasn't a month of big changes, but Marshmallow and Lollipop both had respectable gains. Meanwhile, Froyo continues to cling to life on 0.2% of devices. As you can see, the changes for most versions are very small—most of them dropped under a percent. Both versions of Lollipop and Marshmallow did tick upward, though. While the absolute number of Marshmallow devices is small, a 0.2% gain when they were only 0.3% before is a substantial improvement. The 3.1% increase for 5.1 is the largest we've seen in a while, though. 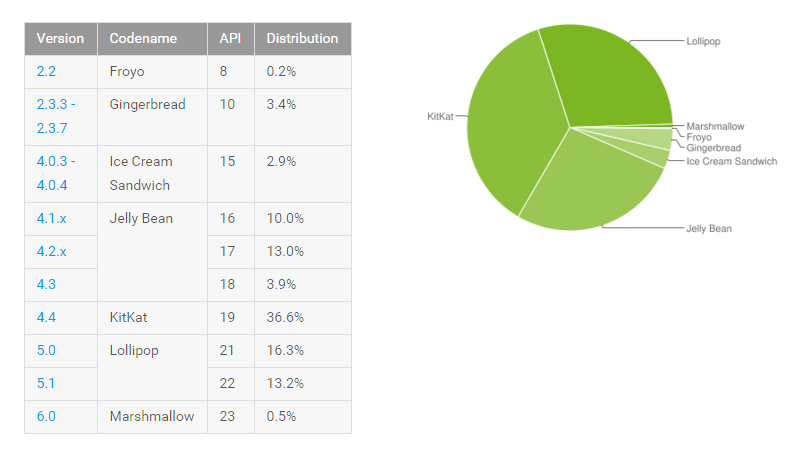 Froyo continues to sit there unchanged at 0.2% of the Android device ecosystem. Google won't remove it from the distro numbers until it drops below 0.1%. Maybe some day.